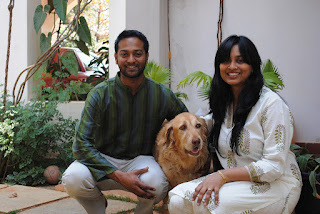 Today, being the letter 'D', I am here to share a few things about our three dogs, two have already left us, and the third one is our yet another cute Labrador. Let me start with our first dog, Cookie. She was a gift from our neighbor. She looked and behaved like a Labrador, but actually she is mix between pure Labrador male and Doberman and a Labrador mix female, so she had both the good qualities of these two breeds, but mostly she had the lovable streak of a Lab She was a beautiful fawn color Lab. Each dog has its own characteristics, even if they belong to the same breed. Cookie's favorite way of expressing her uncontrollable love for us would be to cover her eyes with both her paws and pretend she is invisible, and I should say Kanu, Kanum, which in English roughly means, ' I have disappeared/ or I am lost/ invisible, find me', and I should remove her paws covering her eyes, and say, 'edhu', which means ' here she is'. And whenever we used to take her for walks, I would walk a little slowly as I would love to watch all the beautiful old Anglo Indian houses, in our layout, and when some turn came, and she could not see me coming behind, she would stop and make my husband wait for me, once she sees me coming, and, she knows for sure that, I am alright she would continue with her brisk and joyful walk with my husband. She loved to walk only with my husband, and many times would refuse to be taken for walks by our watchman. 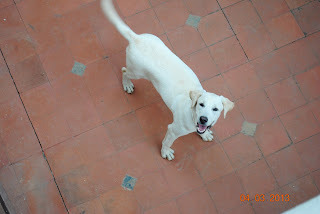 Her favorite food was curd rice with lots of boiled vegetables, and would hate Pedigree (the dog food). 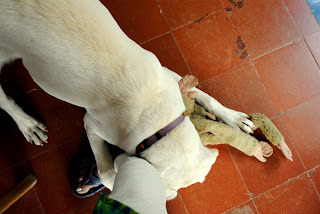 Also, she would want to be fed Banana only with hand, she wasn't a great fruit lover, so we would have to coax her to eat it, by showing her squirrels, crows or other street dogs, and threatening her, that they would get her Banana if she did not finish it fast. She was so much like a human child. Cookie was absolutely adorable. 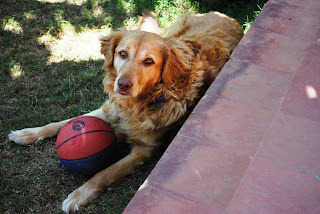 She had grown so muscular, one could see her rippling muscles while she ran to fetch the ball, and her favorite ball used to be the big foot ball. She knew all the basic commands and although very energetic and playful, she always listened to us and never bothered our guests. Sadly we don't have many pictures of her. She had to leave this world, leave us very suddenly. She was just 3 and half years old when all of a sudden she became very weak, and after various tests were done she was diagnosed as having Leptospirosis. It usually takes 4- 12 days after the exposure to this dreadful bacteria for the dog to feel ill. It starts with loss of appetite, progressing to muscle pain, lethargy, vomiting, and mild fever, the eyes start to turn yellow, and so on till the liver/ kidney or both are damaged beyond repair, and the dog dies. Though doctors were quite encouraging, and felt, there was still hope, but after 4 days in ICU, she passed away. It was the saddest day in our lives. 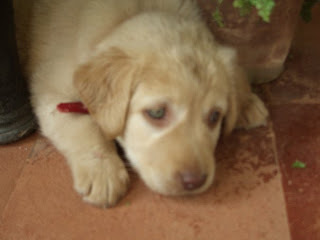 She was our first dog,. As time went by, our neighbor persuaded me to take a puppy who, she promised, would look just like Cookie, same family, same breed, and that she would get it from her brother in law's place in Ooty. I agreed very reluctantly. 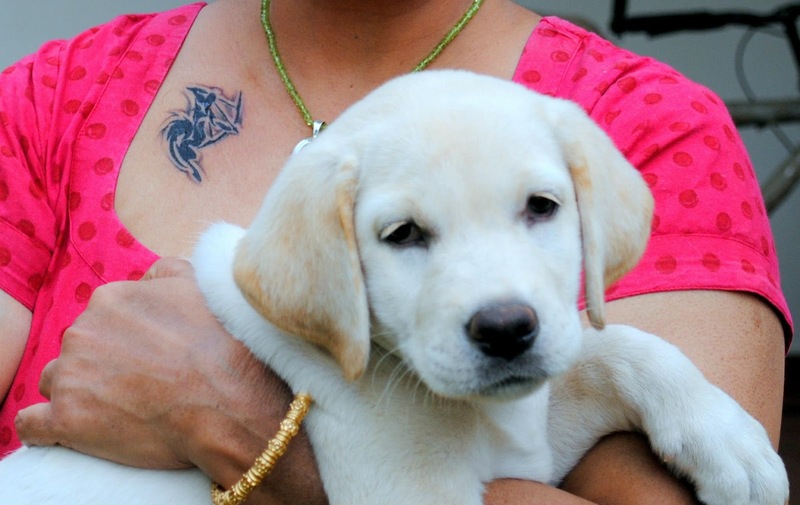 So, they arranged for the puppy to be brought all way from Ooty with one of their nephews in his car. So we had another cute lab ( we thought she was a lab). However, as soon as we took her to our Vet. for shots, he told us, that she was a Golden Retriever, again a cross between GR and Lab. While she was still a puppy she looked a lot like a Lab, but as she started to grow, she developed all the features of a Golden Retriever, and she was a beautiful dog. We named her Toffee. We had to go through the same problems of training a small puppy. it was quite exhausting, but soon she grew up to be a well behaved dog. Her mannerisms were almost just like Cookie, and she was a real joy to have around. She also would not like Banana, would have it if only fed by hand. She also liked to go for walks only with my husband, she too loved watching young boys playing football in the playground. But she would not learn to do "Kanum Kanum" like Cookie. We were very attached to her as she was with us for almost 7 years. 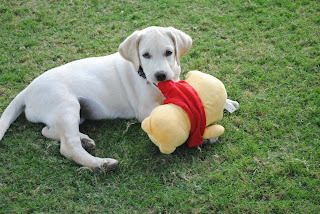 Although she was so grown up, her behavior was just like a puppy, ever ready to play with us. Last year suddenly she developed lumps in various parts of her body, when treated they would go away but only to come back at some other place. She was going through so much pain, but would not show, and just keep resting all the time, refusing to eat, and as if telling us through her tired eyes that her end has come and to just let her go. She went through Chemotherapy too, for she has Lymphosarcoma, again a deadly disease. Just ten days before her death she looked quite well, was even eating properly, we thought she was alright, when again all of sudden she became serious and had to be hospitalised. She was in the hospital for just two day, on the second day we got a call from the hospital that she was no more. She had died in her sleep. Another most adorable dog was snatched ruthlessly, away from us at such a young age: it was really cruel. We can never forget our two dogs, they will always be a part of us. She seemed quite well: she was enjoying all the attention given to her by everyone who had come for the get together in our house. After 5 months we got another Lab, and named her Bumbilli. She seems to be the naughtiest of the whole lot. Dogs are so lovable, they are always so loyal, and they can love unconditionally. They can sense when we are sad, and be our silent supporter and comforter, just lying by our side. When we are happy, they are there to be happy with us. When we are angry with their behavior, they come quietly and lick us, trying to say they are sorry, that they just couldn't help it. They can melt our hearts with their innocent looks. And when they fall sick they can get us worried so much. Bumbilli is the only one who has trainer coming to train her, for she is super active, very naughty and sometimes unmanageable too. 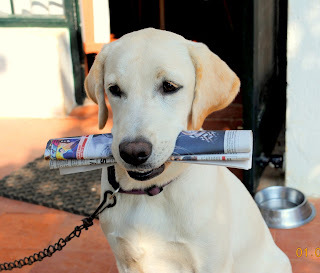 It is now 4 months since her training started and she is getting better and better with each passing day. When we get mad at her, she would immediately salute us ( a down dog movement), and look so cute, that all or anger will just vanish away. She will not salute if we ask her, but will do it only when she wants to be in our good books. She is still a baby, for she is just 9 and half months old. She loves all her stuffed toys and plays with them without tearing them. She also loves to play with squeaky toys, and loves playing ruff and tuff games. She is a real cutie pie. Here she is at her favorite game of catching and locking my leg tightly with her legs and asking me to play with her stuffed toy monkey. entertainment. I only have you. Sure, we will always love and cherish you and learn from you, the art of giving unconditional love. Do you love dogs, and do you have something to share? Kaanom...idho...play is nice. I can imagine how she would have done it! Bumbili looks lovely with her cute eyes! My family is animal lovers...any animal will do for us to pamper! We had Andy and after he died of tongue cancer, we never tried to bring another dog home. Now, only cats...they just eat and sleep...play when they are in mood, that is all. Andy was different. I did a post or two on him. We still remember him often. 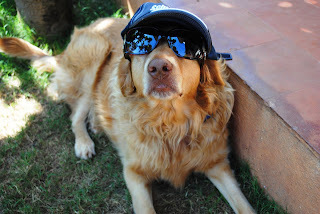 I read your blogs on Andy, really cute dog. Thanks Sandhya. It is really sad when a dog falls ill suddenly, especially with a disease like Lymphosarcoma. 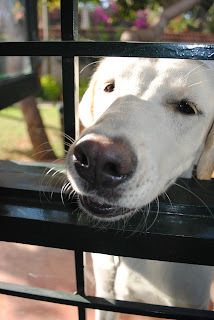 We had no plans to keep a dog when we moved to an independent house,if it had not been for our neighbor insisting we have one, well one came, then another and now another, and I am sure this would our last dog. I see around me, my friends pampering their pets and treating them like little kids. Rearing them is such a huge responsibility. Infact, my children are asking us for pets.Nice names your pets have. Please don't keep a pet because of your children, for they will never look after it, just for a few days they will look after it and after that , it would be there only for them to pet, and nothing else. 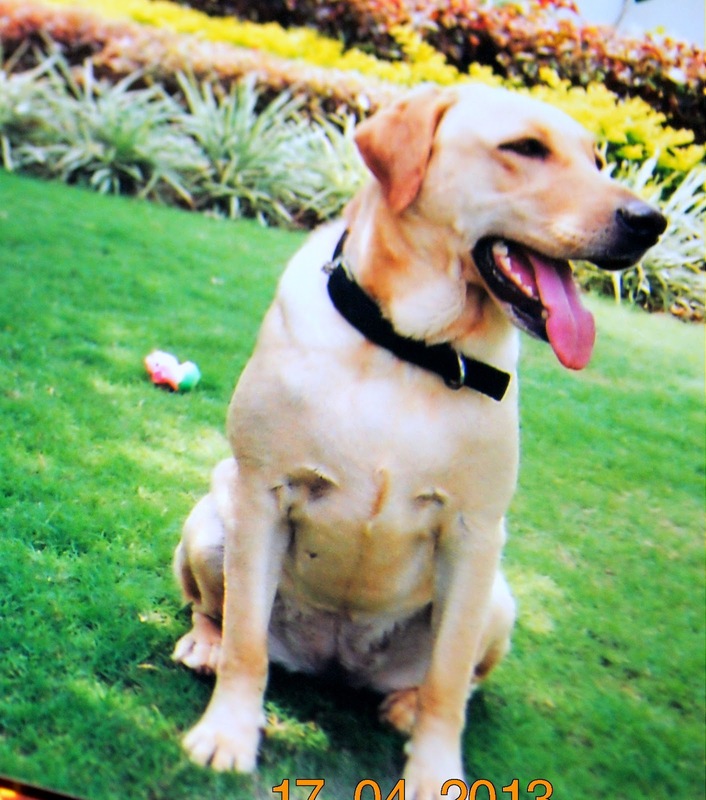 Also it is not advisable to keep a dog in an apartment, dogs need lot of space or someone to take them out often to play and for various other things. Though people do keep dogs in apartments, but frankly speaking it is better not to. even my children were asking for dogs when we lived in an apartment, but knowing them I refused.Keeping a dog is not a joke, it is more demanding than bringing up a child. It has to be taught behavior right from the puppy stage otherwise it would be so unmanageable. One needs lots of patience. Your narration is impressionable.And dogs also no exemption of fatal diseases.I can enjoy cats, dogs etc from a distance only.I appreciate people of their love towards dogs.I am remote-village breed who keeps dogs,cats,hens etc outside the house.Your dogs look attractive,as you might have cared them so well. I can understand your point totally. It is always better to enjoy them from far. One has to keep them clean, and not allow them to come often inside the house, or let them climb the bed, sofa etc. love and discipline has to go together. If they are allowed to come in and do all the things they are not supposed to do, the house will have a permanent doggy smell. They would also shed hair even Labs who have very short hair, it is also very difficult to sweep them away. I don't know how I am managing, maybe because we have plenty of open space, i really don't know, but keeping a dog form the puppy stage is really tough. I knew about Toffee but not about Cookie. I think I wrote you when you lost Toffee about our dogs. 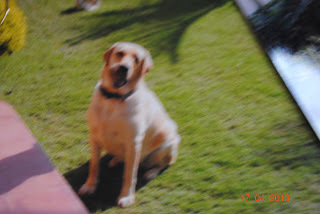 I wrote on my blog too, when we lost Nero, killed by a car at amost 4 months! Firstly, we had a Collie, named Rocky. He died at 14, put to sleep because he was far too exhausted. Then it was a black Lab, called Carra, who died at almost 4 year, paralysed and put to sleep (again!). After 3 years we took a street dog and raised him till a car killed him in our parking place. He was called Nero. After 3 months, my husband who suffered a lot after loosing Nero, came home with a puppy found on the street. He is completely black, only a narrow white tie and short white sockets. The name is Caro (a combination between Carra and Nero). I suffered every time we lost a dog because we are very much attached to them. I wish you luck with your Bumbilli! Yes , I do remember about your dogs, really sad. We keep saying that this is our last dog, but somehow end up bringing another dog home. But this time Bumbilli is going to be our last dog, for it is meaningless to have a dog when we ourselves growing old, and i would hate to leave our dog in the care of someone else after we are no more. 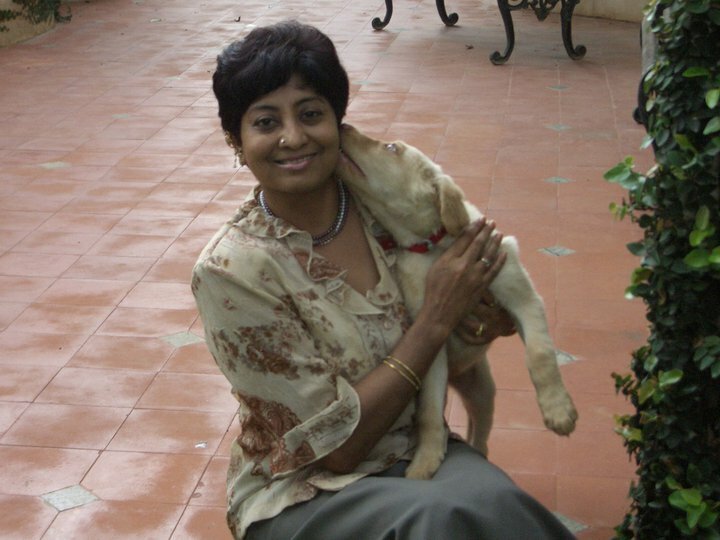 Yes Latha it is always very sad to lose a pet. Even when people die we would not feel as sad as we feel when a dear pet dies. Remember, before getting a pet to think ten times about the life you are going to have with it. All the best! I love dogs, mainly golden retriever, labs and Spaniels! My aunt had a pom, a very rare combination of colored one. We all loved him. 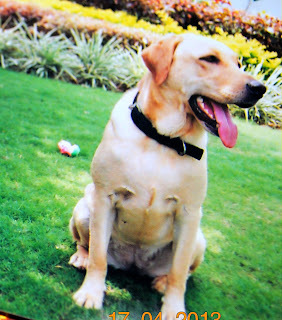 He runs away when he hears crackers during diwali, and would never come out the whole day! As much he gets mad at other dogs! He loves Cucumber and Snake Gourd so much, that he never lets us cut them. He keeps seeing us asking for more! He was such a cutie pie. He actually fasts one day in a month (naturally), which actually shocked the whole of our family. We named him Benzee with our grandpa's name as it's surname. Sadly, it died after being with us for about 8 years i guess. A dog fasting, this is first time i am hearing it. Yes some dogs love all vegetables. Our Bumbilli is one of them, she would gobble anything. The Dogs prayer, is of great meaning , if man choose to hear. The death of a dog reminds me of Neruda's poem, "My Dog has died". I cannot often understand the thought process of people who jump and stay suspended in the air in horror when they see a dog ( a domestic pet for that matter). There are others who inflict such cruelty and show least concern for these magnificent creatures that man do not deserve to have . You , I see always did the right thing top choose another pup when you lost the dog. Perhaps your children's formative age was greatly assisted by the pet dog that was round when they were growing up! Thanks Anil. It is sometimes very difficult to keep another dog, somehow i feel that i might forget my previous dog, but I think they themselves make way for yet another dog to come into our lives, and make us relive the happy days we had spent with them. I suppose they are telling us to pay forward, in the form of loving another dog, saying also, I think that they don't mind. Animal psychology is too deep for us to understand. Thanks Haddock. We can forget all our worries, with a dog by our side. Children are always like that, they don't realize how tough it is to have a dog in a flat, and even when we live in an independent house it is not so easy to keep a dog. It needs a lot commitment, care and love, and you are right it is almost like having another baby in the house. I am sure if she really loves dog she would take care of it in the most responsible way. I've always wanted a dog. My Mom had a pet dog when she was young and so did my dad. But somehow that hasn't materialized. One day I'm definitely going to get myself a pet dog. Such wonderful beings they are. Loyal and most trustworthy! Thanks Ashwini. I am sure when the time is right, you would surely have a pet dog in your house. I've never had one in my life, and I think I would be scared if one comes close to me, but they are just shooo shweett!! Yes Bhav, sometimes it is more fun enjoying them from far. Thanks for stopping by. I love your dogs and have been following their tales through your blog. Lovely pics! Thanks Rachna. I know how much you love dogs. I fully appreciate whatever has been written about doggies. So you had two earlier. I salute you for your courage in having a third one even after witnessing them die prematuredly. I also had a fox terrier which lived for 12 years and it died on my laps. I decided not to go in for a second one. Thank you P.N.Suramanian. Yes I can understand your point, even I went through this every time we lost a dog, but if a puppy has to come to your house it will come somehow. You must be missing your dog so much.